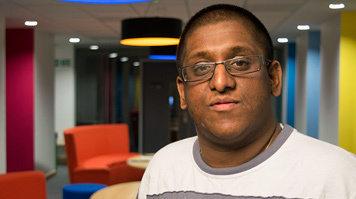 Arun Aravinth Bhaskaran joined LSBU through Clearing and found his new course was better suited to his skill set, which is ever expanding thanks to the opportunities at the university. The Accounting and Finance BA student has built on his teamwork and leadership skills through his roles at LSBU as Student Ambassador, Vice-President of LSBU’s Hindu Society and supporting the Students’ Union Vice-President of Employability and Activities. He also has a gold award for his work as a Course Representative. Arun was recommended LSBU by his dad after he missed out on the grades for the course he originally planned to study. He was accepted on the Accounting and Finance BA through Clearing. By the time he graduates he will be a part-qualified accountant with exemptions from ACCA, CIMA and ICAEW professional papers. In the future he would like to work within the public sector where he hopes to specialise in public accounting. LSBU’s location near major financial institutions in central London suits his plans. “Studying an accounting degree has helped me gain the knowledge I need to become a better rounded professional. While at LSBU he has received three bursaries for: progressing into year two of his studies; his involvement in the Students’ Union Student Feedback project; and taking part in a Black, Asian and Minority Ethnic (BAME) focus group. His main tip for students looking to use Clearing: “Don’t panic. Look on the university's website as some universities tell you where they have clearing spaces. Before you apply for a course through Clearing make sure you have the skills best suited to that course. This is a decision that most people only make once in their life. When you make calls make sure you have all the information they need on hand. These are your UCAS details and grades."